Shooters Fishers and Farmers Party candidate Helen Dalton. PEOPLE on the NSW Electoral Roll will cast their vote tomorrow in the State election which is shaping up to be a hotly-contested result. In our part of the world, the seat of Murray is up for grabs, with a field of 10 candidates vying to win. In what has seemingly been a campaign between just two candidates, people living in the Wentworth Shire will be familiar with sitting National Party MP, Austin Evans, and Shooters Fishers and Farmers Party candidate Helen Dalton, both of whom have been highly visible in the region. As for the other eight candidates, some have profiles in the electorate, others are virtually unknown, just like their parties, and include some surprise late entrants. The would-be politicians include Philip Langfield (Christian Democrats), independent candidate Brian Mills, Carl Kendall from Sustainable Australia, Liam Davies from the Keep Sydney Open Party, and Country Labor’s Alan Purtill – a Councillor and Mayor from Balranald. One Nation’s Tom Weyrich, independent David Landini and Nivanka De Silva, from the Greens, make up the balance together with Mr Evans and Mrs Dalton. Since winning the by-election in October 2017, which was held following the resignation of former Member for Murray Adrian Piccoli, Mr Evans has been a frequent visitor to the Wentworth Shire, and has showered the region with some welcome grants, including the recent announcement of more than $8million to upgrade the Wentworth Aerodrome. Hot-on-his-heels, and likely to be Mr Evans main threat, is Mrs Dalton, who has been a fierce advocate for a better deal for this region’s stakeholders and communities doing it tough in Menindee and Pooncarie. If elected, Mrs Dalton has promised to focus on key issues including water, health and education to improve the plight of communities, who she says have been neglected by a city-centric Coalition Government which is more interested in building sporting stadiums than helping the bush. 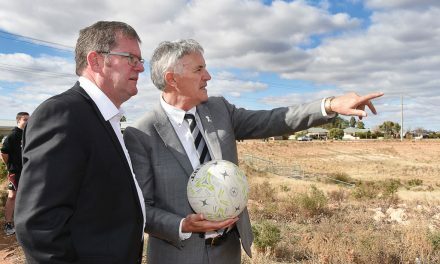 Country Labor’s Alan Purtill has listed a boost in infrastructure for inland rivers as one of his priorities, while also improving drought assistance, which he claimed was non-existent in his community. Greens candidate, Dr Nivanka De Silva, is a rurally-trained medical doctor who is passionate about increasing access to mental health services and promoting inclusive rural communities, which she says thrive on diversity. Dr De Silva has called Deniliquin home since migrating from Sri Lanka with her family as a child. She says that mental health issues impact on many families in her community who should have the same access to professional support as those who live in the cities. Dr De Silva also supports the Greens’ call for a national Royal Commission into the mismanagement of the Murray-Darling Basin. For information about your nearest polling place visit the NSW Electoral Commission website www.elections.nsw.gov.au/Elections/State-government-elections/2019-NSW-State-election, and search the seat of Murray.